One of the drawbacks of living in South Africa is that the furry scene is currently rather small. Despite attempts to bring furs from all over the country together for a national meet, we had limited successes and, even when we managed a national furmeet, only assembled between 14 and 16 attendees. Things have improved during the last few years, and meet sizes have increased quite dramatically, even to the point that plans are underway to reboot the South Afrifur convention in 2016. So, when I moved to Europe, I was glad to finally have the opportunity to attend proper, large-scale furry conventions. I chose two different cons to attend. One was Lakeside Furs, which is a relatively small (approximately 50 attendees) Austrian convention. It made sense as I was now living in Austria and it offered a way to meet the Austrian furry community. 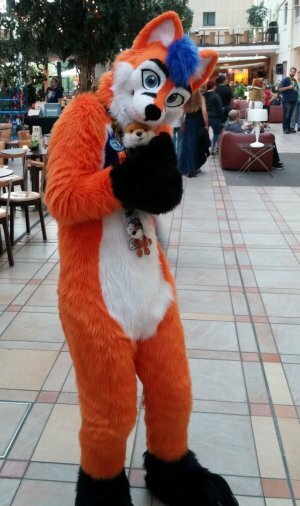 I also chose Eurofurence which, as the largest furry convention in Europe, is an almost obligatory furry visit. Although I didn't realize it at the time, both Eurofurence and Lakeside Furs were started by Unci, although he is no longer involved with Eurofurence. Before I went to either convention, they told me that it was best to go with a group of friends or at least someone you knew. But I didn't listen! That was not entirely by choice; none of the few European furs I was close to were going. Since most of the furs at Lakeside Furs are either German or Austrian, German is spoken by the majority. It is still an international meet and people are willing to speak in English (official announcements were in both English and German) but it's a lot harder to meet people when you cannot listen to a conversation and join in organically. I had a similar issue with non-German-speaking furs, who had travelled in small groups so that the Russian furs spoke Russian, the Italian furs spoke Italian and so on. I did manage to make friends there and once I had formed a bond with someone the con was a lot more enjoyable. 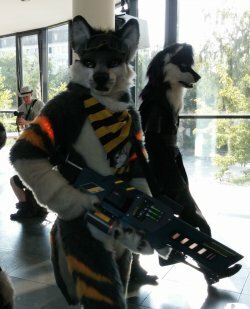 Despite more than half the furs coming from Germany, I did not encounter much German at Eurofurence. This made it a bit easier to meet people (your mileage will vary depending on how social you are) but I also had an advantage over Lakeside Furs in that I knew GreenReaper would be attending. I had never met him in person before but I had known him for years online and that helped speed up the integration process for Eurofurence. 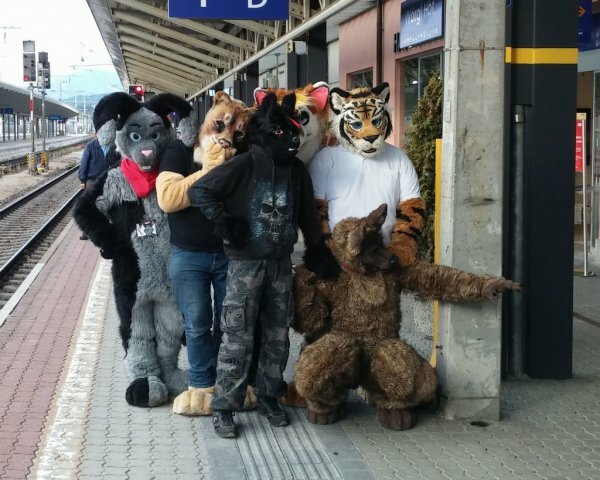 In addition, there were a few furs that I recognised from either Lakeside Furs or from smaller meets in Vienna so there was a certain sense of familiarity. The type of furs that you can meet at a convention also depends on the size and location. A smaller meet, like Lakeside Furs, does not draw in the big names in the furry fandom, unless they happen to come from the surrounding area. Eurofurence provides enough of a draw that you will have the opportunity to meet many of the big name furs and ones who you might only know from their art. For example I got a chance to see RukiFox, Nimrais and AlectorFencer among others, although I didn't actually speak to any of them. I did have a brief conversation with Fox Amoore as I bought a signed CD. One thing of personal interest that I noticed, both at the conventions and beyond, is that there seem to be quite a few people with connections to South Africa. At Lakeside Furs I met Tanit (who also lives in Vienna) and who was preparing to fly to South Africa a couple of weeks later to volunteer at a lion park. This was almost ironic as he was a Eurofurence regular skipping it this year as he would be in South Africa. Conversely I had spent my whole life in South Africa and was at Eurofurence for the first time this year. During Eurofurence, I found myself sitting at a wildlife conservation panel next to a fur, I believe from Denmark, who had spent time volunteering at a cheetah conservation center in South Africa. Adding this to the three people I met at work who had spent time in South Africa, two for work conferences and one volunteering to work with leopards, the world indeed felt small. Both conventions offered a number of entertaining events. Lakeside Furs tended to one larger event per day and was more outdoor focused while Eurofurence was almost fully contained within the Estrel hotel and convention center with many small and overlapping events taking place per day. One thing that only really became apparent to me looking back was that there was not that much emphasis on the furry fandom at Lakeside Furs. There were two suit-walks in surrounding towns but none of the other events were inherently furry; they included a steam train ride to a lake, hiking to an ice cave and archery (where I hit the targets 11 times out of 90 attempts). Other than that we were pretty much left to our own devices, which means the convention will largely be whatever you make of it. Eurofurence goes way in the other direction, containing more activities than there iss time in the day. This includes artist and fursuit lounges, dances, concerts, many panels, an art show and the dealer's den. Many of these were excellent and I could have spent far more money at the dealer's den than I eventually did. I attended educational talks on foxes, the history of the furry fandom, how to draw cute animals, so many more and still missed plenty that I had intended to see. At this point I will make a slight digression to talk about my own panel. I decided I should make the most of my convention experience so when the opportunity to host a panel of my own came up I took advantage of it, merging my previous Flayrah articles ("Redefining Furry", "The New Furry, Much Like The Old Furry" and "What Is Furry Music?") into a talk entitled "Understanding Furry: Defining A Fandom". Personally, I felt that the talk went really well. It was well-attended, I got plenty of questions at the end and even had people come talk to me afterwards. Whether it helped further my way of thinking or not remains to be seen but it was a good experience nonetheless. I especially need to thank GreenReaper for recording the talk (minus the first few minutes as he arrived late) which is now available online. The slides are also available online on the South African furry forum. I was glad that I was not the only one to have a more introspective talk; there was also Uncle Kage's "A Brief History Of The Furry Fandom", KitzKatz's "Funny Animals… Funny Everywhere, Funny Everytime" (which I was not able to attend) and Dragnaros' "What Is Furry" open discussion. Kage's talk was entertaining and, although lacking in details, did provide one or two extra points that I was able to mention in my own history of the furry fandom. I did invite Kage to attend my talk, which he did not, but he was a guest at the later discussion on furry. The discussion was a bit of a disappointment for me. We did cover a few topics and some of it was quite interesting but the format seemed to preclude any meaningful conclusion and it felt a bit like the outcome had been decided before the discussion even began. We were asked "how do you define furry" a few times and many people offered answers which were sometimes discussed but often forgotten shortly after being mentioned. There was no attempt to record them, discuss the specifics and come to an agreement. This was probably because it seemed many people were of the "furry is whatever you want it to be" school of thinking. I find this to be extremely unhelpful and often contradictory and it's times like those that I miss the written form of communication where it's easier to go back, look through an argument and make sure it's coherent. In real time and relying purely on memory that is far more difficult. I say this because there were some points that I would've liked to examine at in more detail. For example, Kage mentioned having to distance the furry fandom from people like Boomer The Dog while also maintaining that if you identified as furry, you were furry and it wasn't about excluding people! Sadly, I spent more time arguing over exactly what was meant by the term "anthropomorphic" which, while important on its own, was irrelevant at the time since Kage and I did agree on the bigger point that humans with animal characteristics were also furry. Aside from the scheduled events, both conventions had plenty of unofficial fun as well. A big part of furry conventions is the ability to socialize with people whom you probably only know online and see once a year or less. A notable, unscheduled event for me was being part of Taniger's PhD research. There are often links to furry surveys floating around and I've been a part of the Anthropomorphic Research Project's longitudinal study for the past three years. However, this was the first in-person interview; a little over 40 minutes of talking about furry and my involvement in it. Now I've got a rare, one-of-a-kind consent sheet. Try finding one of those in an art auction! As I said at the beginning of this article, both Lakeside Furs and Eurofurence were started by Unci, although he is no longer involved with Eurofurence. To the best of my knowledge, this was due to disagreements over the future direction of the convention with some people wanting to grow Eurofurence and Unci desiring to keep the convention small. It was only after Eurofurence that I saw Kage's "Your First Furry Convention" presentation and realized just how much the convention visions have diverged. It was revealed in that panel that Eurofurence has a rule against going barefoot due to safety issues. This is in stark contrast to Lakeside Furs were Unci, who also started Free Paws!, and [ASC] gave a talk and demonstration about walking barefoot, how to do it safely and how to deal with people that oppose going barefoot. There is so much more I could talk about from both conventions but there just isn't space for it all. They were both a lot of fun and I would be happy to visit them again next year. However, they do serve very different roles. Lakeside Furs is a bit like going to a fancy restaurant with a date or some close friends. You know what food is there, you know the company and you know it'll be a great time. Eurofurence is more similar to a food court. It's bigger, it's noisier and there is far more variety to choose from even if you might not enjoy all the dishes on offer. EuroFurence has a rule against going barefoot for safety reasons? How silly, considering no hotel anywhere in Europe ever gave me trouble (or seems to have it in their rules), and US conventions with such a rule seem to refer to hotel regulations usually (and it's an unusually barefoot-hostile country over there). I might disguise as a business human when going to an event of human business, but certainly not for a furry event.